Coming to Glebe couldn’t be easier as our suburb is a mere 10-minute walk from Central Station; however there are other options for those not wishing or unable to walk here. BUSES #431-434 travel along Glebe Point Road from The Rocks area of downtown Sydney via George Street, taking about 30 minutes depending on the time of day, and the #370 runs every 20 minutes from Leichhardt to Coogee and return taking about 50 minutes each way. The METRO LIGHT RAIL (tram) runs from Central Station to the Sydney Casino and the Sydney Fish Market and continues on through Glebe to Lilyfield. The two Glebe stops are “Glebe” which is near Wentworth Park and has steep access to Glebe Point Road, and the “Jubilee” near Harold Park which has flatter access to the Glebe Point area. 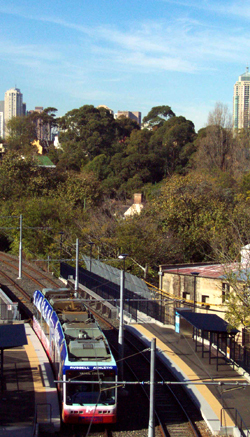 The light rail will be extended to Dulwich Hill in 2014 and later along George Street to Circular Quay. One comment. Please add yours. My mum has just moved into Glebe, so I’ve been doing some internet research, Google maps bicycle, terrain, public transport, Google Earth, with photos, looks as lovely as I remembered it in my younger days. So many little and medium sized Parks.